I was curious to see what Joyce’s hair might look like if I’d tried to draw the hairstyle (I think) I was attempting here in my current style. 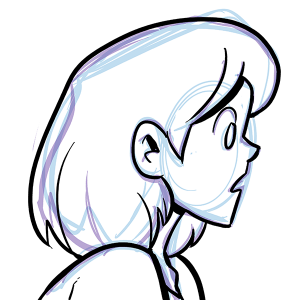 Going into it, I was worried, hrrngh, I hope I don’t like it too much, ‘cuz I don’t want to end up giving Joyce a haircut in Dumbing of Age. If I don’t like it later, Joyce isn’t going to ever grow old enough to have her hair grow out again, so. I hand out hairstyle changes pretty sparingly in DoA for this specific reason. It has to be something I’m willing to draw for basically forever. It actually ends up a little too close to Dorothy’s, and while it might be a little funny to see Joyce kinda Single White Female her… nooooooo. You got yourself into this mess Walky, now you have to get out of it by yourself as well. Hey Willis, have you seen the new Justice League vs Teen Titans movie? There’s a scene in there that I think you and Shortpacked fans will enjoy. Honest feelings, the abductee’s kryptonite. Honestly I can’t tell much difference between Joyce’s current haircut and your recreation. But hey, I’m not an artist. Looks like a pretty decent improvement in the current condition. Her hair is slightly shorter, and poofs out dramatically less at the bottom. Basically, her current DoA haircut- based on her old Roomies haircut- is round on top but then curves out at the bottom and sides, while the alternate hairstyle pictured is a single smooth curve, if that makes since. …which is something present-day David Willis mostly seems to avoid. A similar thing is noticeable with Jason, who has square hair in the old strips but round hair on the redraw on the logo at the top of the site (and in DoA, later It’s Walky, etc). Analysis aside, it’s neat to see an alternate look and a sort of recreation of a bit of old It’s Walky material, but I do agree that Joyce’s regular DoA hair looks a little better. I don’t really think this looks like Joyce’s hair with a different haircut. I think it looks like her current haircut professionally blown dry. More body but no bend. It looks like it’s about the same length, just falling straighter. Never mind, it’s much shorter. I think it looks like DoA Carol’s haircut, and DoA Joyce would really not want to look like her mom right now, all things considered. So I think you’re good staying as is. We’ve all been through this kind of stuff, Walky. I promise it gets better. Yes Walkerton, it’s good for your character development. I love the awkwardness of these It’s Walky strips.